Are you a business-oriented person with the vision and ambition to grow a successful home renovation building company? Building skills are roles within the business (those people will work for you). What we look for are people with core skills more aligned with the ability to lead and to manage and who have the desire to grow a sustainable business in what is an ever expanding sector. UK consumers typically spend over £26 billion each year on renovations. Refresh Renovations is providing an opportunity for you to gain a foothold in this huge market. Being service-based, the establishment costs for a Refresh franchise are far lower than retail franchises. Buy into a proven business model. Become part of a winning team. Join a network of other franchisees, sharing ideas and providing a support network. Operating in a sector of the market that has proven to be extremely resilient during challenging economic times. Have strong managerial skills and business acumen. Have the ability to manage outcomes: plan well, follow proven guidelines and deploy resources effectively. Be sales and marketing focused as well as entrepreneurial. Be prepared to make a long term commitment to business success. Be reputable, ethical and customer service oriented. 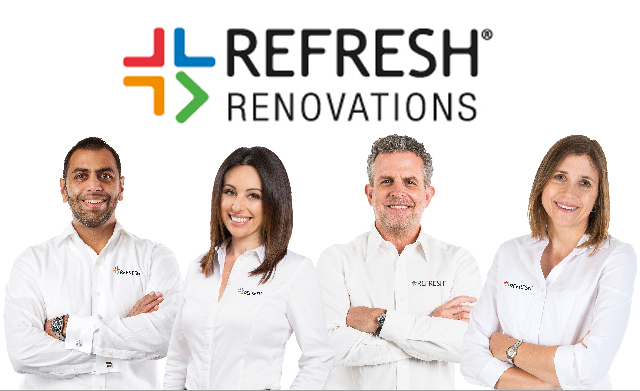 The highly structured business model, driven by award-winning marketing has enabled Refresh to rapidly establish itself as the leading renovation building company in the world. Refresh’s design and build process reduces risk of time and budget blow-outs. Their complete design and build service has a proven process for taking customers from concept to completion. This structured process provides franchisees with a framework for working with customers to ensure they deliver a renovation that is on-time and on-budget, and delivers on the customer’s desired outcomes.